Parents, especially those who recently got the opportunity to call themselves like that, are somewhat anxious people. When you have children, it becomes your ultimate mission to keep them safe at all times. Because of that, it’s no wonder you’re interested in Graco Contender 65 Convertible Car Seat Reviews. 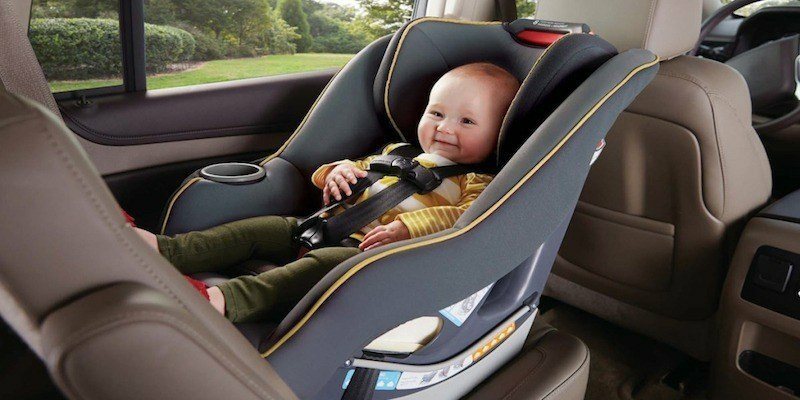 After all, this car seat might be the safest car seat you’ve ever encountered! A car seat is an indispensable product if you want to bring your child with you everywhere. Its main purpose is to protect your child in the car, especially if there’s an accident. Often, it is either rear-facing or forward-facing, but this particular model is both. Therefore, it seems promising, but further investigation is required. 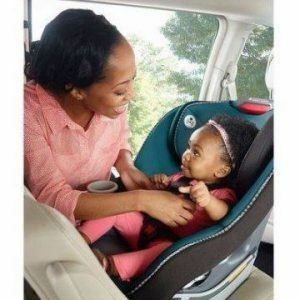 So, before we give our honest opinion about it, let’s look at the main features of this car seat and how you could benefit from buying it. Let’s start with the basics. Even though the design itself appears a bit bulky, the car seat is fairly lightweight. It weighs just over 15 pounds, which means that you will be able to carry it to a plane and through the airport without too much trouble. Furthermore, the Graco Contender 65 dimensions are also quite convenient. It is 26 inches high, 20.75 inches wide and 27 inches deep. The weight limits are 5-40 lbs in the rear-facing position and 22-65 lbs in the forward-facing position. 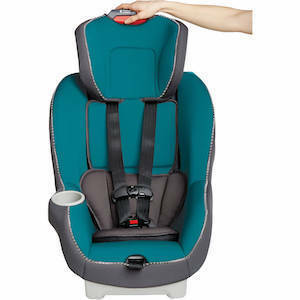 You should also keep in mind that this car seat is an inexpensive, yet high-quality product. Even though its price might confuse you at first, it turns out that it has a lot to offer. Not only has this car seat been designed to suit all your needs, but it also went through a serious crash test. The result of the Graco Contender 65 crash test is the fact that this car seat meets and even exceeds the US standard FMVSS 213. For a worried parent, that’s a great advantage, as it means that it will be unlikely that your child will get hurt during a car accident. However, the car seat will only be as safe as you make it. That’s why Graco has implemented various safety precautions that will help you keep your child secure at all times. Those precautions include the 5-point harness system and the energy-absorbing foam. When it comes to your children, safety is non-negotiable. The child has to be safe at all times, which means that safety features should be at the top of your list when shopping for products like this one. Luckily, the Contender 65 will give you the peace of mind you deserve. Its safety features are more than enough to convince you to buy the product immediately. The design is also something that will appeal to you, as it is quite neutral, yet beautiful. It will go well with pretty much any car interior, which is not something you can say about most car seats. Furthermore, it comes with a feature that will undoubtedly be useful while your child is growing up - the cup holder. Also, it features comfortable padding, so your child will not mind sitting in it even during long trips. And, the best part is that you can remove the support and wash it. Lastly, bear in mind that this is a convertible car seat. That means that you will not have to purchase another one any time soon, as it can go into the rear-facing and the forward-facing position. The energy-absorbing foam will keep your child comfortable while riding rear- or forward-facing. However, if there is a car accident, it will absorb the shock of the impact and maintain a safe atmosphere. Therefore, your child will not feel a lot during the impact, and it won’t probably even be harmed during the accident. The 5-point harness system is there to help you buckle up your child without too much hassle. But, what’s even better is the fact that your child will not be able to unbuckle itself that easily. The Contender 65 Convertible Car Seat also has a bonus that most parents will love. Other car seats usually don’t have the shoulder straps connected to the headrest. 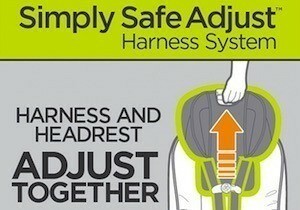 However, this Simply Safe Adjust System is a great addition, as it allows you to adjust the headrest without rethreading the straps. You can use just one of your hands to do it. All you have to do is lift the reverse lever that’s on the top of the seat and pull up and down. Both the headrest and the straps will slide, and you can quickly adjust the seat that way. Furthermore, the headrest goes into eight positions, so you can easily adjust it while your child is growing up. Some car seats can give you more trouble than you might have thought. But, in the case of the Contender 65, you will see that the installation is pretty simple. The seat is latch-equipped, so you can either use the latch-system to secure it in place or the car seatbelts. Furthermore, there is a rear-facing position level indicator. It will tell you if you’ve positioned the seat too high or too low. There’s a blue circle in the leveler, and once the ball is entirely in the blue circle, you will know that you’ve perfected your car seat installation skills. This support system will help your children stay comfortable while giving them the right support for their back and head. However, as children grow, they need a bit more space. Therefore, it’s great that Graco thought of that too. You can easily remove the head and body support when you feel like your child has outgrown them. It’s a convertible car seat that you can easily adjust both for rear-facing and forward-facing position. The 5-point harness system is high-quality and well-designed. The headrest and the straps are connected, so you can adjust the height with just one hand. The seat has been tried and tested vigorously - it will be a tremendous and extremely safe addition to your car. The seat cover is removable and washable. This car seat doesn’t recline, which might be a dealbreaker for some parents. You have to put in a lot of effort to tighten the latches. Otherwise, the seat can move a lot in the car. Once in place, this car seat is difficult to remove. Overall, the Graco Contender 65 is an excellent option for those parents who need a bit more reassurance regarding their child’s safety. The crash tests prove that this car seat will keep your child safe in car accidents, and given the fact that it also comes with user-friendly add-ons, like the cup holder and the Simply Safe Adjust System, the car seat is worth every penny. 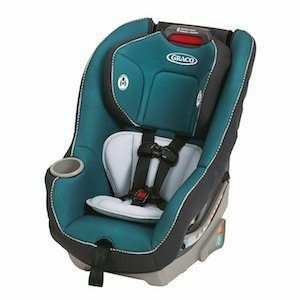 Other Graco Contender 65 Convertible Car Seat reviews might give this product a 4 or a 3.5, but we think that it deserves a 5-star rating. Thus, we would recommend it to all parents who don’t want to spend a lot of money, yet don’t want to compromise on their child’s safety either.